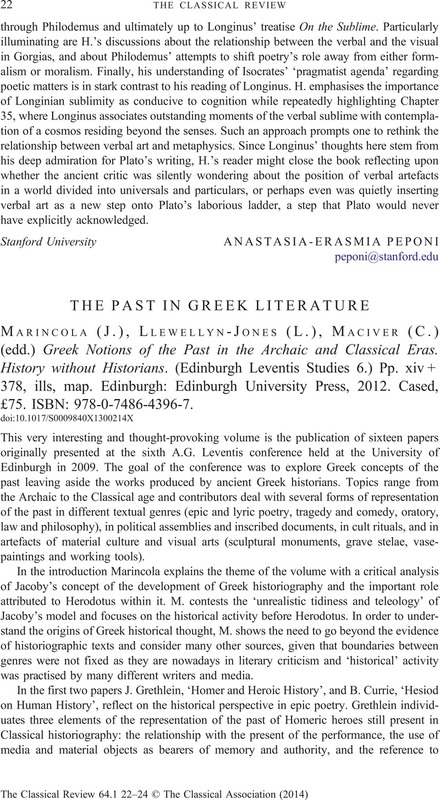 THE PAST IN GREEK LITERATURE - (J.) Marincola, (L.) Llewellyn-Jones, (C.) Maciver (edd.) Greek Notions of the Past in the Archaic and Classical Eras. History without Historians. (Edinburgh Leventis Studies 6.) Pp. xiv + 378, ills, map. Edinburgh: Edinburgh University Press, 2012. Cased, £75. ISBN: 978-0-7486-4396-7.